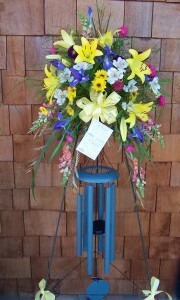 Cleveland Florist is a Full Service Florist and we carry all types of gift items in our shop. Corinthian Bell Windchimes, Concrete Stepping-Stones and Angels as well as pottery birdhouse and feeders are great keepsakes for any occasion. Corinthian Bell Windchimes are made in the USA by QMT Windchimes. One of the best selling windchimes on the market, they combine exceptional design with incredible tones and resonance. Each set of windchimes are individually handcrafted and hand tuned and come with a 5 year warranty. They come in different sizes: 27″ up to 78″ and colors: black, copper, green, patina green, midnight blue and ruby splash. Our most popular sizes are the T106 (27″ Tuned to Scale C), T206 (29″ Tuned to Scale A) and T306 (36″ Tuned to Scale E). They make a wonderful gift or tribute for a loved one or friend. Starting at $59. We can gift wrap for only $3. 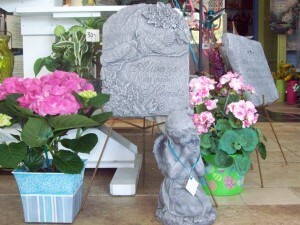 Concrete Angels of varies sizes for the garden are also available. We have Concrete Stepping-Stones with different tribute sayings (please call for list). Stones are displayed on a metal easel and is included in the price of the stone. We have other gifts from: hand painted pottery birdhouses and feeders, baby items, TY beanie babies and other stuffed animals, and other housewarming gifts. Please call for availability.